LinkedIn expands it services further with the release of its new mobile applications for all BlackBerry devices including Tour, Curve and Bold models running OS v4.3 or later. The new LinkedIn for BlackBerry is a handy application that will be most useful for looking up professionals worldwide, in real-time. Network Updates – for viewing and sharing crucial business intelligence and updates. Search – for searching across 60 million global professionals, and get the answer back in seconds through a unified search across both your direct connections and the entire LinkedIn network. Connections – for getting quick access to any of your connections to get their up-to-date profile information, and the ability to send them a message immediately. Invitations – for accepting outstanding invitations immediately. Messages – for integrated access to BBM and LinkedIn messages. Reconnect – for bringing suggestions for new connections. Of course, it’s major purpose is for quickly viewing LinkedIn profiles right on your BlackBerry devices, anytime, anywhere. In the business setting, you can get an upper hand during board meetings if you know some personal details about the people you will be negotiating with, prior to the meeting proper. 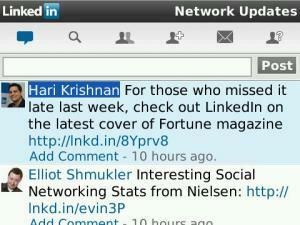 LinkedIn for BlackBerry is available now as a free download here. It will soon be available in the BlackBerryApp World as well.